Only a short drive from Prague, the Hotel Grand Revnice is located in the centre of the charming little town of Revnice, which used to be the favoured destination for those wanting to escape Prague and enjoy a weekend in the countryside. Today, Revnice still attracts visitors due to the beautiful landscape all around, which is part of the Bohemian Karst Protected Area. On one side, you can see the Berounka River while the other is sheltered by the Brdy mountain range. The Hotel Grand Revnice is a perfect base for exploring the Bohemian Karst Protected Area and the Brdy mountains, a beautiful corner of the Czech Republic. This Revnice hotel is a great starting point for walking or cycling holidays in the area, as you can hike or bike to the nearby castles of Karlstejn, Krivoklat Zebrak and Tocnik, as well as to Chateaux Horovice or Chateaux Mnisek pod Brdy. If you are feeling more energetic, then you could try one of the many sporting activities available, such as table tennis in the hotel garden or tennis, volleyball, canoeing, cross-country skiing in the Brdy mountains or even paintballing in a nearby wood. The possibilities are endless! You are bound to work up quite an appetite after all that walking, cycling and outdoor fun, which is where the hotel's 2 lounge bars and restaurant comes in. 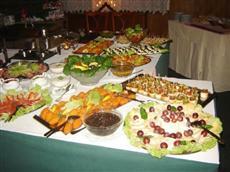 The restaurant serves traditional Czech cuisine, as well as oriental and vegetarian dishes. There is also a cable Internet connection in the restaurant which guests with their own laptops can use for free. For your entertainment, the hotel also organises historical fencing demonstrations, magic shows and Czech folk music and dancing upon request.